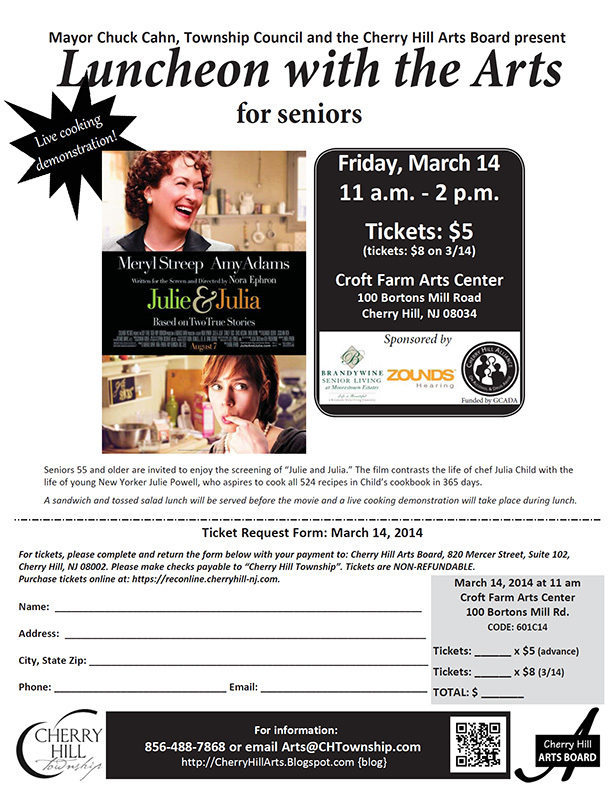 Tickets available for 3/14 Luncheon with the Arts for Seniors featuring Julie & Julia! Seniors 55 and older are invited to enjoy the screening of "Julie and Julia." The film contrasts the life of chef Julia Child with the life of young New Yorker Julie Powell, who aspires to cook all 524 recipes in Child's cookbook in 365 days. A sandwich and tossed salad lunch will be served before the movie and a live cooking demonstration will take place during lunch. For more information: 856-488-7868 or Arts@CHTownship.com. Sponsored by Brandywine Senior Living, Zounds Hearing and Cherry Hill Alliance on Alcohol and Drug Abuse (Funded by GCADA). Senior Luncheon and movie: Julie & Julia, Fri., Mar 14, 11 am - 2 pm. Tickets: $5 ($8 on 3/14). Call to reserve tix today: 856-488-7868.